In the Bangalore shivir, Babaji had mentioned about the great siddha - Ramalinga Swami of Tamilnadu. A sadhak, after attending the Bangalore shivir returned to Pondicherry and was surprised when he was confronted by a friend who asked if he wanted to see Swami Ramalinga's shrine. Taken by surprise he visited this holy place and bought a Tamil book on the Siddha. Immediately he contacted me and enthusiastically shared this strange "coincidence" and promised to share the book in his own words for the blog, for the benefit of all. It is the sadhaks' request to stay anonymous. In gratitude to you friend for the tedious work and in gratitude to Babaji, Namah Shivaya. During the Banglore Shivir Babaji talked about two great Holy Siddhas of South India: Thirumoolar and Ramalinga Swami. 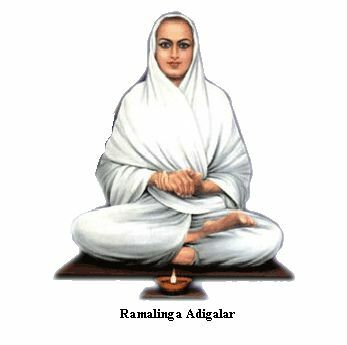 Ramalinga Swami, commonly known as Vallalar, is a Holy Siddha who lived in the 19th century. He attained Light, the ultimate yogic objective. Maruthur is a small village near Chidambaram, Cuddalore District in Tamil Nadu of South India. There lived a couple Ramayya Pillai and Chinnamai. 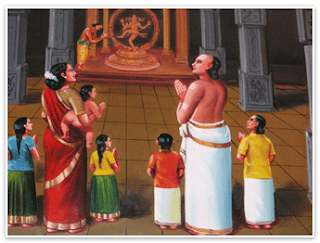 They belong to saivaite family and they were great devotees of Lord Nataraja (Lord Siva) of Chidambaram. Ramayya Pillai was village Accountant. His Graciousness Ramalingam was asked to come in onto this world on 5th October l823 Sunday at 5.54 P.M. by the Almighty with a mission to wipe out the miseries and sorrows of the humanity at large and to awake them to live DEATHLESS ETERNAL LIFE as a fifth child of Ramayya Pillai and Chinnamai. The Divine child was named as Ramalingam. Five months old baby Ramalingam was taken to Chidambaram temple by His parents for offering prayers to Lord Nataraja. As usual the priest lit the camphor and offered it to the Lord at the Sanctum Sanctorum. No sooner the light appeared, the five months baby Ramalingam laughed loudly and gazed at the empty space created by the curtain lifted. The significance of this incident was that the Almighty revealed the secrecy and showed His true form as the GREAT DIVINE GRACE LIGHT (ARUT PERUN JOTHI). When Ramalingam was six months old baby His father Ramayya Pillai demised. Chinnamai left the maruthur along with her five children to her parental house at Chinnakavanam near Ponneri, north to Chennai in Thiruvallore District. After some years, again she moved to Chennai with her children in search of better lively hood. They lived at Sevenwells street in the Mint Area. Her eldest son Sabapathy Pillai was well educated under the above scholar, Kancheepuram Sabapathy Mudaliar and started giving religious discourses to run the family. When Ramaiingam was five years old he was sent to Sabapathy Mudaliar to attain formal education. Ramalingam was very quiet in the class room and showed no interest in his studies. But one day it happened to hear a new and fresh beautiful Tamil poem with full of substance of high order sung by young Ramalingam has boundless wisdom and he was already taught everything by the grace of the Almighty and nobody could teach him anymore. This was misunderstood by his elder brother who was also his guardian that Ramalingam was unfit for studies and an irresponsible boy. Young Ramalingam started composing Divine poems while his peers were playing in streets joyfully. His poems were fresh and pretty as roses, sweet as nectar, choked with Bhakthi Rasam. They were innovative and revolutionary. His poems thrown new light on oriental spiritualism and religious philosophies and gave new directions. His poems attracted great scholars, religious heads, yogis, intellectuals and illiterates all alike. He used to recite songs in praise of the presiding deity Lord Muruga at Kanthaswamy Temple at George Town, Chennai. Sabapathy the elder brother was worried about his younger brother Ramalingam's career and wanted to correct him by threats and punishments. He stopped giving him food and clothes and ultimately driven out of his house. 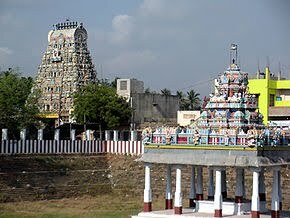 Ramalingam spent most of his time at the temple and temple tanks. He went around the streets and came across the ocean of people. It gave him an opportunity to understand the sorrows and the miseries of people. Pappathi Ammal the sister-in-law of Ramalingam was so affectionate to him and took care to feed him without her husband's knowledge. On one of the death anniversary days of his father Ramayya Pillai, it was conducted in style with the rituals and the poor feeding. Young Ramalingam was missing in that ceremony and starved without food while many people were fed with varieties of delicious dishes at his home. Sabapathy and his wife Pappathi Ammal both were very sad for missing their young kid in such an important occasion. Somehow she was able to catch Ramalingam in the evening and fed him with remaining food. He saw his sister-in-law in tears. She conveyed her feelings to him warmly and asked him to stay at home and to devote his attention towards his studies. He was also agreed to her wish. and confined to His room all the time. He never came out of His room except for taking bath and food. He used to meditate deeply. Sabapathy was used to give religious discourses. Once he agreed to give series of discourses on'Periapuranam' the biography of63 Saiva Saints. The organizer Somu Chettiar a rich and strict man. After few days Sabapathy became ill and was unable to fulfill his commitment. He did not know what to do. He was so worried. Then his wife suggested him to send Ramalingam to continue the discourses. It looked ridiculous to him and he did not agree. At last after much persuasion he agreed to send Ramalingam reluctantly. He strongly advised him to behave properly with the rich organizer and to complete the day's pooja by reading out one or two stanzas. His Graciousness Ramalingam as advised by his brother conveyed his message to Somu Chettiar the organizer and began his discourse in front of packed audience. Everybody looked upon the young boy hopelessly, since the subject matter was of very high order to be dwelt only by eminent personalities. The young boy taken up the word "Ulagelam" which was the first word in "Periapuranam" for annotation, words came out eloquently just as waterfalls flow. The language, style, substance and versatility were so amazing and wonderful the extraordinary geniusness and unparalleled audience of the young boy made the audience stunned and everybody came to a conclusion that he was none but DIVINE GRACE sent by the Almighty. The organizer and the audience decided to continue with His Graciousness Ramalingam in place of his brother Sabapathy. Few days later Sabapathy went to the discourse hall, hiding himself sat with the audience to listen his brother and he was thrilled to know about His genuine scholarship for the first time and regretted for his ignorance and mistakes. At the age of nine His Graciousness young Ramalingam was adopted by the Almighty voluntarily when he was so innocent. The Almighty gave him all the wisdom needed to attain the Divinity. At the age of twelve he began practicing true Divine life. His Graciousness Vallalar started to visit daily Thiruvottriyur Siva Temple, the oldest temple in south India. He wrote and sung many number of songs in praise of Thiruvottriyur Siva and the Deity Vadivudai Ammai. One day he returned home at late night and fell asleep on the pail with acute hungry. The temple deity Vadivudai Ammai came to him in the guise of His sister-in-law and fed him with nectar. He also visited Siva temples in and around Chennai such as Thiruvalithayam Thiru Mullaivayil etc. 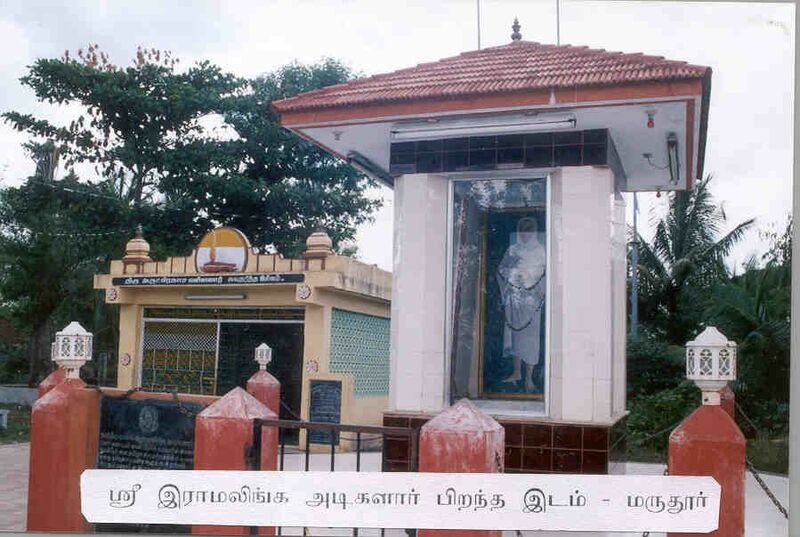 In the year 1849 Thozhuvur Velayutha Mudaliar, a 17 years old young scholar came to Vallalar and gave him hundred poems written by himself in the style of the Sangam Literature and lied that those were old Sangam verses and sought His criticism on the poems in order to test his knowledge. But Vallalar promptly replied that those were not Sangam poems but written by a beginner who did not know even the grammar properly. 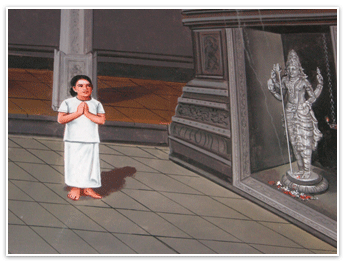 Then Velayuthanar realized his mistake and prayed pardon and to accept him as his student. Vallalar gracefully accepted him. Vallalar did not like to marry. His complete liking rested at the feet of the Almighty. Due to the fate and the compulsion of his close relatives and well wishers he agreed to marry. He wedded Dhanammal, daughter of his own sister. Later he confessed with the Lord that he touched a lady (to tie sacred thread namely Thali), but not had family relationship with her. Eminent - Scholars and religious heads became His students and disciples. Among them Thozhuvur Velayutha Mudaliar stood First. He published "THIRU ARUTPA" from first to fourth parts (Thirumurai) the collection of songs sung by his Guru Vallalar. Vallalar wrote 'Manumuraikanda Vachagam' and 'Jeevakarunya Ozhukkam', both in prose. He published three books namely ozhivilodukkam, Thondaimandala Sathakam and Chinmaya deepikai. He also gave 'Foreword' to the literary works done by other scholars. His Graciousness Vallalar was fed up with the busy materialistic Chennai life. He needed calm and quiet countryside life in order to Practice divinity. So he decided to leave Chennai and set on pilgrimage to Thillai that is Chidambaram in 1858. In Chidambaram he met Venkata Reddiar. Venkata Reddiar requested Him to stay at his home in Karunkuzhi a small hamlet near Vadalur. There he lived for nine years from 1885 to 1867. He used to visit Chidambaram Nataraja Temple very often. He wrote many poems in Venkata Reddiar's house in Karunguzhi. One night while His Graciousness Vallalar was writing poems, the light became dim. He poured water into the oil lamp instead of oil. But the light was lit on uninterruptedly throughout the night. It signified the greatness of the Thiru Arutpa. He was so concerned about the sorrows of the humanity. His face was looked grim and His heart was melted. He was always in tears. He wept for the other's sufferings. Due to His supreme compassion which was unparalleled and unique by itself, He was glorified with reference as THIRU ARUTPRAKASA VALLALAR. The songs sung by him were called ARUTPA (the songs of the Divine Grace). There is only ONE Almighty, not many, as people believe generally. True nature of the Almighty is DIVINE GRACE (ARUL) which is in the form of light and it is called as Great Divine Grace LIGHT (ARUT PERUN JOTHI). The Almighty by name 'Great Divine Grade Light' is unique' and not among the other Gods people worship but the GREAT RULER of all Gods and Deities. All religions are false and faulty. No religion on this earth reveals complete truth about the Almighty transparently. Everybody must realize the Almighty and worship with pure love and compassionate service to the living beings. We must stop killing lives and instead we have to save them from the jaws of death. We must stop eating flesh of other living beings and eat pure vegetarian food which is harmless for our body, mind and soul. We must feel and treat every person as our 'SELF' we must not distinguish people in the name of faith, religion, caste, colour, language, territory, rich, poor, learned, illiterate etc. We have to feel and treat all alike. All the souls are equal. There must be emotional unity of souls (ANMANEYAORUMAIPPADU). His Graciousness Vallalar confessed with His Father, The Almighty that all lives became His own life; all world became His own world and the Almighty made His life in separable from compassion. He also added that if compassion was separated from Him, He would become lifeless. There is no other painful suffering like Hunger. Hungry of the helpless poor people is the most painful of all sufferings. Everybody must, willingly, sincerely and promptly feed the hungry poor with food with compassion as if he is feeding the Almighty. This is called JEEVAKARUNYA OZHUKKAM. Not to think, speak and do any harm in any form to any living being is the definition of JEEVAKARUNYA OZHUKKAM. Instead we have to protect and save the living beings from all kinds of pains and sufferings. This is the charted duty imposed on everybody by the Order of the Almighty without any exception. JEEVAKARUNYA OZHUKKAM i.e. Graceful Compassionate Service to the lives is the KEY to open and enjoy the treasure house of Blissful Eternal Pleasure. The human body bestowed to man is not to perish. Death is not natural. DEATH IS UNNATURAL. Death is the only punishment that the Almighty gives. Death means destruction of human body, comes not by fate, but by our impurity of thoughts, words, deeds habits and lack of sincere whole heated effort to safeguard the body. Dead body should not be burnt but, it should be buried. Performing rituals perpetuated by Religions, faiths, castes, or by tradition should be avoided. His Graciousness Vallalar established Dharuma Salai on 23.05.1867 to feed the poor with food and thus removing the hunger of helpless poor. In other words this Salai can be considered as a workshop which trains people to become fit to serve others with selflessness, sincerity, politeness, humbleness and obedience. SATHIYA DHARUMA SALAI is a rich resourceful place that imparts Divine qualities and Grace of the Almighty. His Graciousness Vallalar constructed an octagonal Hall of Wisdom (SATHIA GNANA SABAI) in the year 1871. This grand great construction cannot be seen as a building made up with the sand and bricks. Sathiya Gnana Sabai is the perfect model of our physical body (pindom) as well as the universe (Andam). In other Pindam is a tiny Andarn and Andam is the largest Pindam. Both are same in its contents, character and functions thus the Holy Gnana Sabai resembles the true structure can able to get rid of all illusions such as anger, lust, selfishness, untruth etc then he could see and experience the Great Divine Grace Light in, His Inner Self. This experience is symbolically shown in Sathya Gnana Sahal ( Hall of Wisdom) by removing seven colour screens (illusions ) one by one and finally the Great Divine Grace Light (Arut Perun Jothi) Will be shown dazzling. This is called 'JOTHI DHARSHAN'. Jothi darshan is conducted once in 27 days that is on the day which falls on the astrological star, namely "poosam". In the month of 'Thai' the Tamil month (January/February) when the FULL MOON and POOSAM star coincide, that day is called 'THAIPOOSAM'. 'Thai Poosam' is grandly celebrated every year at Gnanasabai. On 'Thai Poosam' day our soul and inner self is elated to higher level and it is very easy to experience the Bliss of Arut Perun Jothi. His Graciousness VaIlalar was with great compassion directed us to come and experience the Jothi Dharsan in Gnanasabai on every Poosam day to attain divinity. His Graciousness Vallalar went to stay in the Sithi Valagam, in a tiny village called Mettu Kuppam 6kms away from Vadalore to avoid disturbances by his affectionate followers. In the words of His Graciousness Vallalar, "Sithi Valagam” is a place where you can get crores and crores of times of "GOOD" than your parents, brothers and sisters, friends, close relatives and wellwishers can give you. It is absolute fact that I promise you. This is the Order of the Almighty". Sithi Valagam is the most holiest place in the Universe. The Divine Grace is so vibrant here. One can get what he wished to. In the Sidhivalaga Thiru Maligai His Graciousness Vallalar had lit the Djvine Light of True Wisdom (Sathiya Gnana Deepam). HE used to worship the Divine Light of True Wisdom in side his sacred room nearly for four years from 1870, He with all of His Graciousness kept the Sathiya Gnana Deepam outside the room and directed his disciples and followers to consider it as the Almighty in real and worship it with true love and compassionate service to all living beings. At present the same, Sathiya Gnana Deepam which was worshiped by HIM is spreading the Divine Light of Grace even today uninterruptedly. 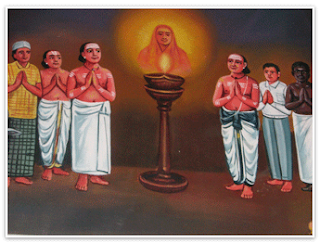 One can experience the Divine Grace meditating at the feet of the Gnana Deepam. It is different from that of all other lights in colour and size. 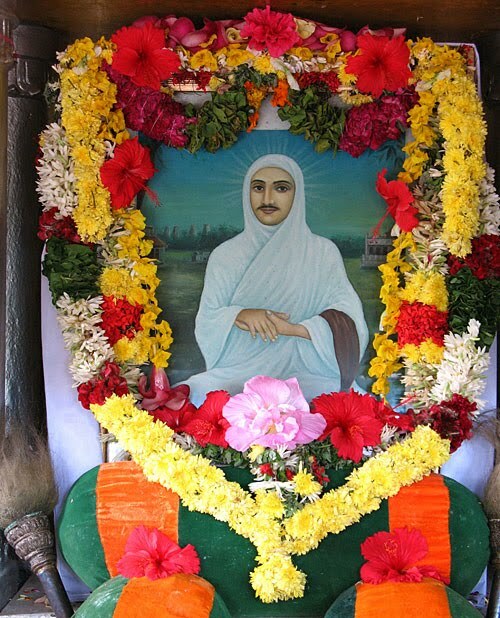 His Graciousness Vallalar delivered the Holy Address (maha Upadesam) to the world in brief by hoisting the Sanmarga Flag with yellow colour at the top and white at the bottom at Sithivalagam, in Mettukuppam. By flying the Sanrnarga Flag, His Graciousness Vallalar declared the Universe that he triumphed in attaining BLISSFUL ETERNAL LIFE WITH THE DEATH LESS BODY. Right through the ages from the day the creation started to this day nobody attained the Eternal life with deathless body. So far saints, founders of religions and their Gods, everybody was dead and their human body was perished. His Graciousness Vallalar was the first in the history to attain Eternal life along with his physical body without letting it to perish. Sanmargi is one who lives Eternally beyond any time scale. Sanmarga Flag denotes that Sanmargam has emerged and here after people will start living Enternal Life with Deathless Body. On 7th Aypasi (Tamil Month) at 8.00 am Sanmarga Flag Hoisting ceremony is celebrated every year at Mettukuppam. Everybody can attain deathless life. We can attain it by the grace of Arut Perun Jothi. When our soul is filled with extreme compassion to the core and our SELF disappears, then the grace of Almighty comes to us. When feeling of oneness with each and every living being and the unity of souls comes to us, then the supreme compassion also comes along with it. To develop the feeling of oneness with all the lives we have to shed all our illusions and differences with the other lives. Attachment with religion, faith, rituals, caste, language and territory is the barrier to the compassionate service. Killing lives and eating flesh must be stopped at any cost. In short, feeling of oneness leads to compassionate service and compassionate service fetches grace of Almighty and the Grace of Almighty bestows Blissful Eternal Life. His Graciousness Vallalar had transformed His physical body into SUTHA DEGAM, the body of complete PURITY which is in the form of pure GOLD. Secondly Golden body was transformed in to PRANAVA DEGAM, which is in the form of LIGHT and again the body of light was transformed into GNANA DEGAM which is in the form of pure WISDOM which means Great Intellectual Space of Divine Grace. "I am the eldest son of the Arut Perum Jothi." "O my father, you gave me full power to do five Great Professions, and to great power to do everything. So it was clearly understood that Vallalar became synonymous with the Almighty and no difference persisted between them. A photographer tried His best to have HIS photo but he did not succeed. There was no image and the film looked as if it was exposed to the light. It was clearly proved that though he was seen in the physical body, in fact His body had undergone changes and transformed into body of Space of Divine Grace which cannot be perceived by materialists. His Graciousness Vallalar himself clarified that if a physical body was transformed in to Gnana Degam (body of the space of Divine Grace), the body would not produce any kind of effluents viz. sweat, urine, motion etc. Shadow of the body would not be there it would not be obstructed by walls, mountains. The body could not be burnt by fire, wet by water, shaken by the air. The legs would not touch the earth and the body would not be wounded by any weapon such as knife, pistol or atom bomb, the Gnana Degam was immortal and would never be destroyed. Then His followers out of curiosity started watching him whether our Lord Vallalar possessed these qualities. They observed closely and found him passing through the wall into his room; His shadows were not there under the bright sun, he was able to see and speak to the people far away in different places directly. He did not take any kind of food or drinks. There was no etlluent from His body. His followers experienced a Fragrance which was truly different and unique. On 30.01.1874 (Tamil Month Thai 19, Srimuga year) night His Graciousness Valialar stepped into His room and asked His desciples to lock His room and instructed them that HE wanted to stay inside the room for some time. He also added that none should try to open the door. If the Govt. Authorities persist to open it, the room will be found vacant since the Almighty should not let Him down and ultimately He would enter the soul of every living being and lead them to the path of Divin Grace. Vallalar with His mightly Divine Graciousness is guiding, and leading every living being to attain Divine Grade. Let all living beings live in peace. thanks a lot jacob , you did a great job brother. Once babaji told.. i remember .. that after a long session of meditation in a banglore shivir, he said "" ... bless you.. everybody should become like swamy ramalingam.. you know he just disappeared when he got realisation.. ""
exactly :) Babaji said that it is possible to ascend with the body itself, like Ramalinga Swami did.. namah shivaya.. Thank you Jacob. You are doing a phenomenal job through this blog. Keep it up for the benefit of all Sadhaks. thanks to you jacob bhai, thanks to that 'unknown' sadhak and thanks to all the Siddha Gurus, to Vallalar and to Babaji, who all are ultimately ONE.. Dhan Gurudev! Namah Shivaya! thnx jacobbhaiya.namah shivay n may baba always bless u..